The most successful fundraiser is one that consistently reaches or surpasses its goal. At SI Memorials, we strive to make planning your fundraiser as seamless as possible. We integrate sales, design, material and production all in one single company. 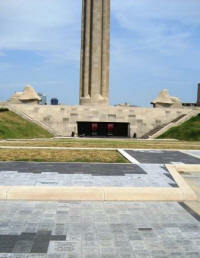 SI Memorials supplies the engraved bricks for the Liberty Memorial in Kansas City, Missouri. Locations throughout the Midwest to quickly and efficiently fulfill your order. Expert craftsmen's to ensure names and artwork will be engraved deep into the stone and last for generations to come. Artists who can incorporate detailed line art from original logos, clipart and other existing sources. Graphics can also be custom-designed to suit your needs. State-of-the-art computer-aided CAD drafting system sets names and graphics across as many as 24 bricks allowing you to sell more bricks per patron. SI can incorporate other elements such as granite pavers, bronze plaques and statues, flagpoles and granite benches into your fundraiser to increase revenue potential. SI will help you customize brochures, posters and fliers to quickly and easily promote your event. Order forms and brick layout forms are available to ensure accurate information and improve the overall turnaround of the fundraising project. George Selby of SI Memorials installs engraved brick pavers at the Korean War Memorial in Overland Park, Kansas. Visit our fundraising tips page where you can download and print ideas and tips on coordinating a successful fundraising project. To send a request for more information, click here. Or give us a call at 1-800-367-8099 and let us help you plan your most successful fundraiser ever!